The field of exoplanet research is expanding rapidly. We are able to identify hundreds of exoplanets and estimate their orbital parameters, masses, and radii (see exoplanets.org). But the next step lies in characterizing their atmospheres – in observing atmospheric temperatures, chemical compositions, albedo (how reflective the atmosphere is), dynamics, and structure. We expect a huge diversity of exoplanet atmospheres, as the formation and composition of an atmosphere depends on a planet’s evolutionary history, its present distance from the host star, and where in the disk it formed. Hot Jupiters are believed to have primitive atmospheres in that little evolution has taken place and they contain roughly the same atmospheric gases as they did at their formation. By studying such atmospheres we will probe these planet’s formation history in a way that has not been done before. How do we detect an exoplanet’s atmosphere? When the exoplanet passes in front of its host star, the exoplanet’s atmosphere will absorb the host star’s light at specific wavelengths. 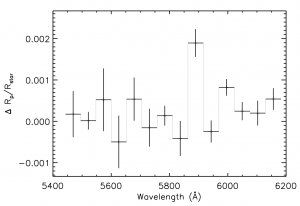 These absorption lines correspond to specific energy transitions within the elements in the exoplanet’s atmosphere. They will therefore tell us the exoplanet atomsphere’s composition. Comparing the two spectra gives the planet’s transmission spectrum (see Nathan’s astrobite and Caroline’s astrobite), where the specific absorption line is deeper during transit than out of transit. 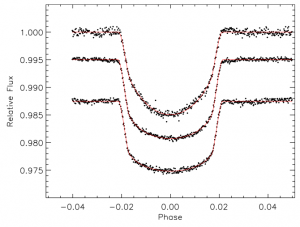 It’s not easy to obtain the exoplanet’s transmission spectrum. Until recently, it was only feasible using space-based telescopes. On the ground, the earth’s atmosphere is a huge hindrance because it has many of the spectral features we might look for in the spectrum of an exoplanet. The earth’s atmosphere is also turbulent, meaning that the exact shape of its spectral features may change with the weather. One technique to avoid confusing changes in the earth’s atmosphere with changes in the atmosphere of an exoplanet is to simultaneously observe a comparison star while observing the transit. At the end of the day you can divide the comparison star’s spectrum by the host star’s spectrum, deleting any atmospheric effects, and reducing the noise to Poisson noise only. Figure 1 – Three broadband transit light curves corrected for slit losses. The effects of limb darkening may be seen by comparing the blue spectrum (top) to the red spectrum (bottom). Sing et al. used this technique to observe the atmosphere of the Hot Jupiter: XO-2b. Presented in the paper are two transits observed using the Gran Telescopio Canarias (GTC) 10.4 m telescope in the Canary Islands. Both the host star and the comparison star were observed together using the widest slit width (5 arcseconds) available. This attempts to minimize any slit losses: the amount of light lost as the star drifts slightly out of the slit. When we receive less light than the star, the transmission spectrum is less bright, resulting in weaker absorption lines. While these fluctuations are minimal, they are on the scale of detection. In order to reach the necessary precision, Sing et al. applied a limb-darkening model (see why this is necessary in Figure 1), parametrized and then removed slit losses, and subdivided the spectra into wavelength bins. Finally, they divided the target star’s spectrum by the companion star’s spectrum in order to account for effects within our own atmosphere. The team observed a clear but narrow sodium absorption line (see Figure 2), at the 5.2 σ level. Such a high uncertainty means that there is a one in a million chance that this result is not real. They fit various atmospheric models to their data, which take into account radiative transfer and chemical equilibrium, but do not take into account haze or photo-ionization. The sodium feature in these models is much wider than the one observed. Such a narrow feature is due to (1) haze or clouds, which obscure the line wings, or (2) the sodium abundance dropping suddenly as altitude increases. XO-2b is the first Hot Jupiter to show both sodium and potassium (found by a different team) in its atmosphere. Theoretically, these metals are thought to be responsible for the low albedos of hot Jupiters. Both lines are pressure broadened, implying that they efficiently absorb the incoming stellar radiation. The results presented here represent the first step in observing exoplanet atmospheres from the ground. Thus far we have probed which molecules exist in a few exoplanet atmospheres. Soon we will be able to detect high velocity winds and Rayleigh scattering from haze. We have characterized the atmospheres of less than ten exoplanets. By opening up the frontier for ground-based telescopes to do such ground-breaking research we will be able to characterize the atmospheres of hundreds of exoplanets. 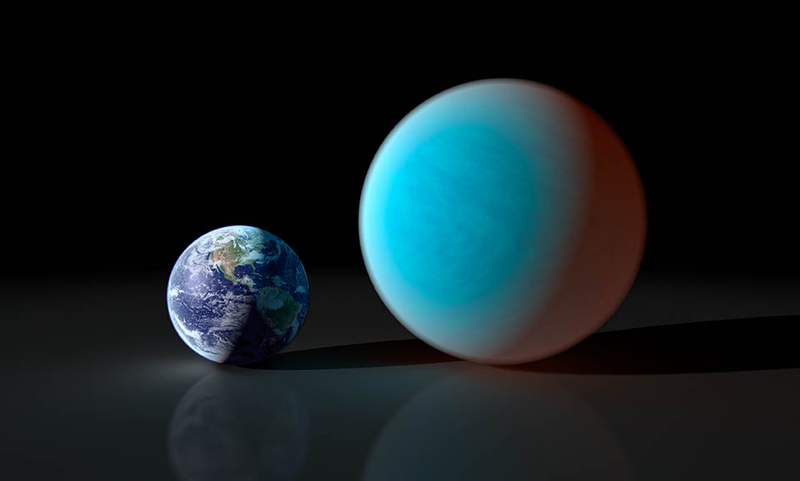 Spitzer works in ‘warm’ mode to observe a hot planet An update on the atmosphere of super-Earth GJ1214b Searching for Life via Exoplanet Smog Habitability Whether Rocks Weather or Not?